We were honored when Dan Broderick, Regional Managing Principal for Southwest U.S., and Mexico Cushman & Wakefield asked us to plan their corporate retreat, and also very excited. Cushman & Wakefield is a global team that specializes in commercial real estate development. The reason why we were excited was because their only request was to make it fun. This huge guideline made it really difficult for us to begin planning with the limited options of fun in San Diego. Should we begin the corporate retreat with outrigger canoes? Sailboats? Ropes course? It was a tough decision which ultimately ended up being the ropes course at UCSD. We also added a team lunch at La Jolla’s Glider point, and cocktail hour at the Farmer & the Seahorse. First, the team building retreat kicked off with lunch at La Jolla’s Gliderport. Everyone enjoyed a delicious meal from the Cliffhanger Cafe. With breathtaking views atop the sea cliffs of Torrey pines, and watching hang gliders take flight, the Cushman team enjoyed a unique dining experience. After lunch, we teamed up with expert challenge course facilitator Denise Ouellette to help design a customized event at the UCSD Challenge course for the Cushman & Wakefield Team. This involved delivering and analyzing a needs assessment survey to ensure that all goals would be met during the challenge course. The challenge course involved two sessions. The first session involved ground-based team building activities focused on communication and awareness on teams. We enjoyed watching the human sculpture pictured above. 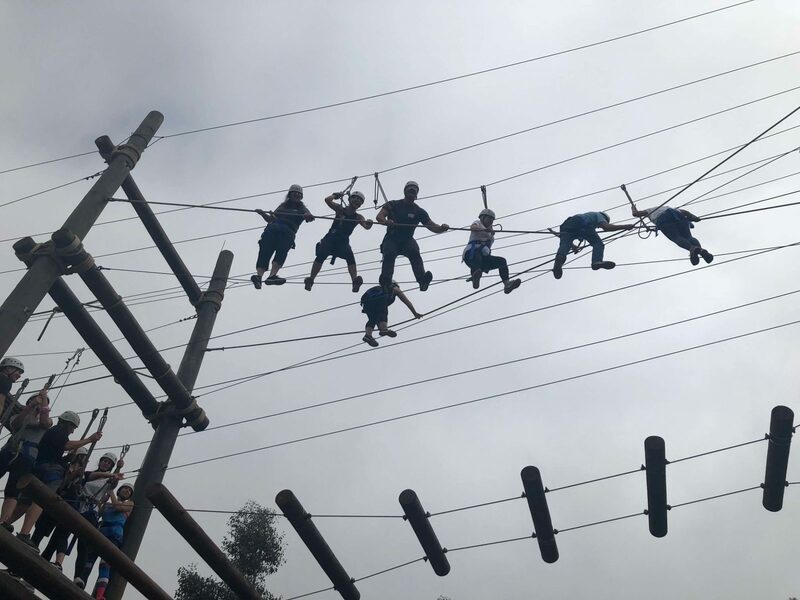 The second session was the high ropes and zip line where the teams split into two groups and had to face a series of challenges on top of being over 100 feet in the sky and overcoming their fears. We concluded our evening with happy hour at Farmer and the Seahorse. We gave away funny awards to members as the team reflected on their day and talked about moving forward. If you would like to enjoy a team building day like this or learn more, visit our Corporate Retreats Page. Special thanks to Denise Ouelette and her team at the USCD Challenge Course for partnering up with us to deliver an exceptional team building retreat experience.